A collective groan from Pacific Division general managers could be heard coast to coast when the Sharks pulled off the biggest trade of the summer, adding superstar Erik Karlsson to their defensive stable on the eve of training camp. The landscape-altering deal elevated San Jose to elite contender status and effectively sealed their place as odds-on favorite to recapture the division title from the Golden Knights. As the rest of the division falls in line behind the Sharks, Vegas’ encore is the story to watch. The expansion darling’s improbable first season in the NHL was a wake-up call for the Pacific’s old guard. 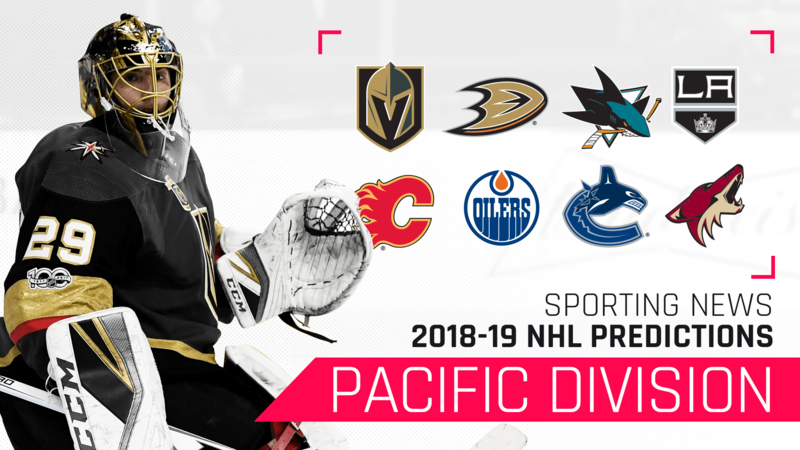 And as teams like the Ducks and Kings age, there’s a sneaking suspicion the Coyotes, Oilers or Flames could take their place in the playoffs as soon as 2018-19. Whether Erik Karlsson’s acquisition alone raises San Jose to the same pedestal as Nashville, Winnipeg or Vegas remains to be seen. But GM Doug Wilson, regarded as one of the NHL’s shrewdest executives, wasn’t keen to sit on his laurels this offseason, and the roster is undoubtedly improved from 2017-18. Instantly, Karlsson creates a defense corps that should be the most dangerous in the NHL in terms of jumping into the play and driving possession. The group already included 2017 Norris Trophy winner Brent Burns, routinely among the NHL’s select few to challenge Karlsson’s point output, and Marc-Edouard Vlasic, one of the game’s best shutdown defensemen. Only Nashville (P.K. Subban, Roman Josi, Ryan Ellis) and Tampa Bay (Victor Hedman, Ryan McDonagh, Mikhail Sergachev) can compare. The message for 2018-19 is clear: The Sharks are squarely in “Win One for Joe” territory, as Joes Thornton and Pavelski age deeper into their 30s without a Cup. Corey Perry might’ve been a pivotal scorer for the Ducks in 2018-19. The 2011 Hart Trophy winner has plummeted from 25-goal lock to fringe top-six forward in two underwhelming seasons, and Anaheim, already short on goal-scoring punch, was counting on the 33-year-old’s return to form. Those hopes are gone, with Perry out five months after undergoing preseason knee surgery. On the other hand, the Ducks have fared fine without Perry’s goals the last two years. The injury is an opportunity for Jakob Silfverberg, Ondrej Kase and Troy Terry to contribute more in an offensive capacity. Anaheim still has John Gibson, arguably the NHL’s best goalie, and one of the league’s deepest defenses. It’s time to lean on the younger, quicker forwards more heavily after the Sharks skated circles in a sobering first-round sweep of the Ducks last year. Last season’s expansion darlings are back for an encore. There were many questions about how GM George McPhee would navigate the franchise’s first true offseason, managing immediate expectations with long-term well-being. But the Golden Knights seem to be pulling the right strings. Gone are James Neal and David Perron, two main contributors from the inaugural season whose losses will be felt, but aren’t irreplaceable. Luring Paul Stastny away from the conference rival Jets killed two birds with one stone, and the blockbuster Max Pacioretty trade was a swing-big, message-sending move that should numb any disappointment over Erik Karlsson landing in San Jose instead of the Sin City. Vegas is out to prove the greatest first season in sports history was no fluke. A step back would be natural, but this is still very much a playoff contender. It’s not easy to make sense of the 2017-18 Flames. All that talent never came together under Glen Gulutzan, for one reason or another, and the franchise opted for sweeping changes this summer, both to the team’s culture and their one-ice product. The draft day blockbuster shipping Dougie Hamilton to Carolina was a surprise; he partnered with Mark Giordano as one of the premier defense tandems in the NHL. But an ensuing character assault on Hamilton and brother Freddie Hamilton allowed the franchise to spin the deal, scored in favor of the Hurricanes, as a fresh start for all involved. Much will be expected from Elias Lindholm, Noah Hanifin and, eventually, Adam Fox to shift perceptions of trading a high-end defenseman in his prime. New coach Bill Peters, hailed in Carolina as a skilled tactician, is out to show his style can produce playoff results in his first year with the Flames. Ilya Kovalchuk is one of the NHL’s more curious storylines for the 2018-19 season. Once considered hockey’s most feared sniper, the 35-year-old returns to North America after a five-year hiatus in the KHL and the Kings are counting heavily on the assumption he’s still an effective goal scorer. Except, players of Kovalchuk’s age typically don’t score 30 goals (2013-14 is the last time a player over 35 reached that mark), a total he achieved the last two years overseas. Is he still able to beat NHL goaltending with regularity? And more critically: Can he skate well enough to match up against top competition in a league that’s become increasingly younger and quicker since 2012-13? A healthy Jeff Carter rejoining MVP-level Anze Kopitar, Drew Doughty and Jonathan Quick should help Los Angeles remain competitive. But this was already an old, slow, plodding team last season, which led to their swift playoff demise. The Kings didn’t do much this summer to correct that. In some ways, the Oilers are still the same 103-point team that blitzed the NHL two seasons ago, stirring up Stanley Cup chatter. Connor McDavid is Connor McDavid, two years more advanced. The rest of that core — Leon Draisaitl, Ryan Nugent-Hopkins, Cam Talbot, Adam Larsson, Oscar Klefbom, et al — is intact, save for Jordan Eberle. But they’re also the same as the 2017-18 version, which wilted under those Cup expectations, dropping 25 points year over year. So what does all that mean for 2018-19? After committing the cardinal sin of missing the playoffs with McDavid, it was expected the Oilers would try to shake things up after a wasted season, by trade or otherwise. Status quo includes ownership’s decision to spare Peter Chiarelli, and they insist there’s a plan to set the team back on track without a complete overhaul. Failing that, heads will begin to roll before next summer sets in. If everyone is picking the same darkhorse team to make a surprise playoff run , does it mean they’re no longer a dark horse? It’s true: We’re all trying to predict if there will be another Avalanche or Devils. And the Coyotes are this year’s most popular last place-to-playoffs candidate, with a young, dynamic nucleus, steady veterans scattered about the roster and an underrated goalie who led the NHL in save percentage (min. 40 starts) last season. There’s a lot to like. Except, the old hockey adage: Don’t judge a team based on its performance in garbage time. So sure, Arizona finished strong toward the end of 2017-18, when Antti Raanta returned from injury. There’s an internal belief they would have challenged for a playoff spot had he been healthy start to finish. But there are still a lot of question marks before we pencil in the Coyotes for their first playoff berth since 2012. The Canucks might be the only team in the Western Conference without a case for the playoffs. Seriously. That’s not intended as a slight, but operating in reality, Vancouver is officially a team in transition sans the Sedins (even if the ever-impatient Francesco Aquilini disagrees), one filled with promising young talent but far too many holes to ice a playoff contender just yet. Even a shaky braintrust, led by hockey’s whipping boy Jim Benning, has managed to draft and develop Bo Horvat, Brock Boeser and Elias Pettersson, rated SN’s No. 1 prospect for 2018 . The focus now is building around those three and whoever they’ll draft in 2019.